Your business likely requires customized views of the data that is core to the creation of your product. Decades ago, accomplishing this involved development of large data analysis software libraries that were customized to a company’s particular needs, along with user interfaces that enabled employees to view the data, so they could respond to anomalies. Much has changed in recent decades. Data analysis code that had to be custom-developed decades ago is now available in software libraries such as Python’s NumPy and SciPy. Similarly, modern data display libraries available, for example, Matplotlib. This code is well tested and verified by a large user community. By utilizing these libraries, developers can simply call verified functions, rather than developing new custom code. In this post, I illustrate how a mere ~50 lines of code (including documentation comments and blank lines added for readability) can gather the past week’s performance of an API from a given geographical location and create a web site that illustrates when a company’s product was perceived by their customers as being slow, or down. API performance is critical for modern applications. People use their phones and tablets to immediately access information that is relevant to what they’re doing or thinking about right now. If your company’s objective is to provide this information, then you need to know how your product appears to your customers. If your product is down, but your competitor’s product is up, the result is simple: you’ll lose customers. The first step, if your goal is to create an API performance report that is customized for your own product, is to get the data for the APIs that are critical for your product. API Science aggregates all the data from your API monitors, and this data is available in multiple formats. In this example, we download the data in JSON format using a Linux cron that executes a curl command to download API performance data to a local server. Ultimately, we’ll use this data to create an example custom web site that provides your team with the essential information that would allow them to monitor critical API performance and recognize when immediate action is required. Once you have the raw data, you can use your company’s preferred programming languages and the custom libraries your company has developed to deliver API performance data to your team in a familiar format. Each entry contains the averaged data for the time period specified by the resolution defined in the curl request. Python is one of the major scientific data analysis programming languages today. There are other languages well suited for scientific data analysis, including Java and C. In this example, we use Python as the language that reads the JSON and produces the view of the data your team needs to see. The same type of coding can be implemented in other languages, if your corporate development platform doesn’t include Python. The data body is loaded into Python as multiple arrays within the Python dictionary. Thus, information like “averageConnect” can be accessed from within the Python dictionary, and used to provide your team with reports that can be used to optimize your product’s performance. The Python dictionary allows us to access this data using the JSON titles for each data item. In other words, the Python dictionary contains individual arrays titled averageResolve, averageConnect, etc. In this MatPlotLib example, we plot the averageTotal data, that is the total number of milliseconds between the initiation of the request to the API and the completed download of the response. perf is the Python dictionary into which the JSON is read. n_results is the number of results stated in the JSON download from the API Science API (a week of data averaged in one-hour time bins). Following the printing of n_results, we initialize hourly_perf_total, a floating point array sized at the number of results. Then, in the for i in range(n_results) loop, we copy the 168 averageTotal values into the hourly_perf_total variable (programmers well-versed in Python will note that this is an unnecessary step; but I did it this way to provide clarity to non-Python programmers who might read this post). 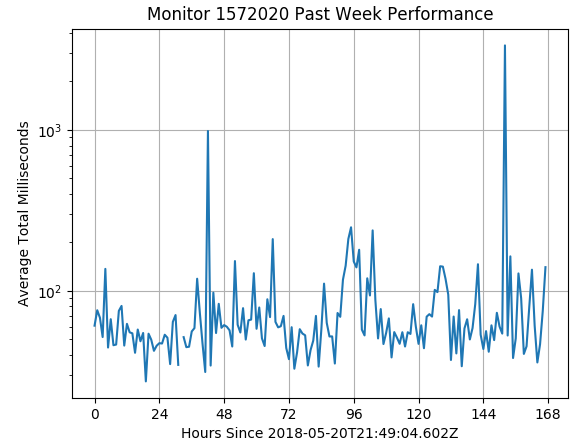 Now we have an hourly_perf_total array that contains 168 values representing the total performance data for the API binned hourly over the past week. The average total milliseconds are plotted in a logarithmic scale to point out to the team instances where the API’s performance was particularly poor. For example, the two peaks that touch and exceed 1000 milliseconds (one second) could represent times when your product will have been seen as down by many customers, especially if access to this API is but one of many APIs your product depends on. Now we need to bring all of this together in order to create a constantly-updated web page that your entire team, including management, can observe at any moment to review the recent performance of an API. The body section displays the latest image that was produced by MatPlotLib. The head section defines the title that is displayed on the web browser window. But the head section also includes the meta http-equiv line. This tells the user’s browser to refresh the page every 60 seconds. That is, the user’s local web browser will automatically reload the page content every minute. So, whenever a new API performance PNG image becomes available as a result of the batch processing that is producing the images, the web page will be automatically updated with no user interaction required. This technique provides the capability for displaying critical API status views that can be observed at any time by any member of your company in an automated manner. The same technique could be replicated for any number of your critical APIs. The results could easily be agglomerated into a single summary web page suitable for managers. Meanwhile, the status page could be created such that the developer team could easily click to review the lower-level details of recent anomalous performance in a particular API. So, utilizing modern programming libraries and APIs, around 50 lines of code provides your team with constantly updated, concise, important information about how your customers have recently been perceiving your product. API Monitoring, API Science API, Integrations, JSON, Performance, Reporting, Teams. permalink.